We haven’t heard anything from our friends, Justin and Victoria, today. Last night, for the first time in well over a year, saying good night to their little Moriah didn’t mean kissing her on the forehead, checking in with the nurse and heading home with the phone close at hand. Greeting their little girl this morning meant simply stumbling into the next room. 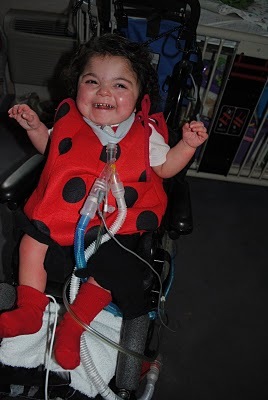 MORIAH GOT TO GO HOME YESTERDAY!!! As this week has had it’s share of tear s, it feel so good to have happy ones rim my eyes as I type this. This is an unchosen journey, but we are buoyed by having met some incredible people on the way. As we’ve felt burdened by their struggles, we truly rejoice with them over such significant milestones. It might seem appropriate to wish the Nelsons a peaceful weekend, but I’m inclined to pray for the opposite. I hope they have an exhausting one. Not the kind of ICU-exhaustion they might be accustomed to; but the kind that comes from having to read the same book seven times in a row…from taking long walks around the block to keep a little one occupied…from never-ending games of peek-a-boo behind the couch…from just plain being giddy over the goodness of God evident in the precious little girl before them. We love you, Nelson Family! Cutest ladybug I ever saw! Rolf and I had another early start Tuesday morning to make it to UCLA for a 9am appointment with Rudy’s pulmonologist Dr. Pornchai Tirakitsoontorn. 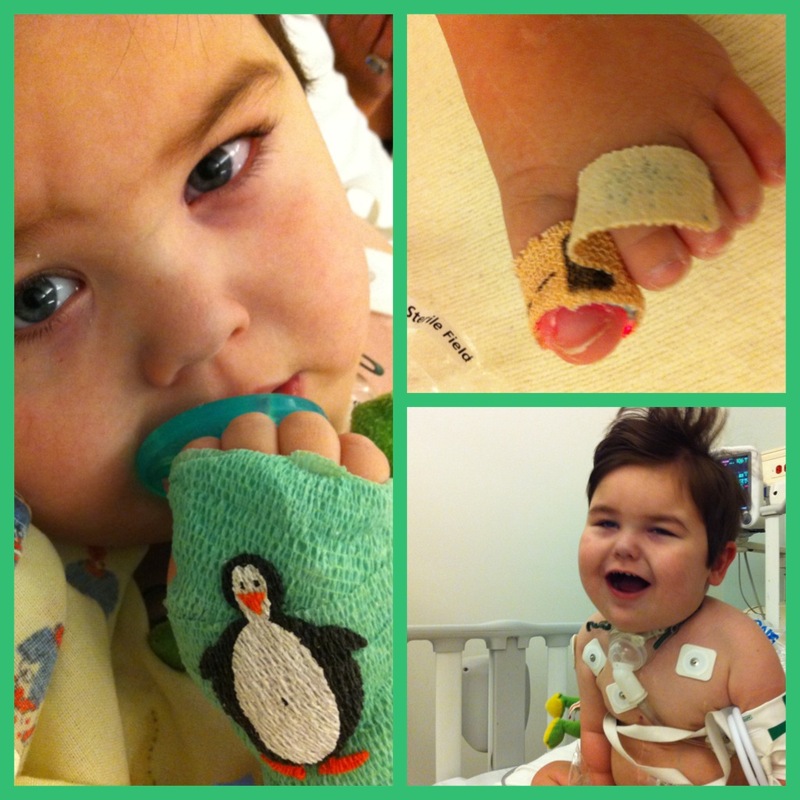 We were eager to talk with him and hear his thoughts about Rudy’s heart cath results. 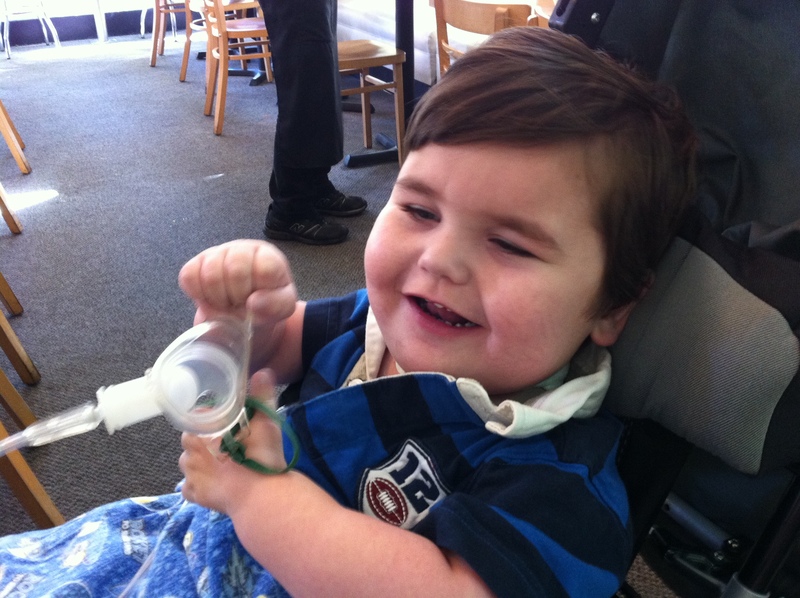 Like us, he is surprised by the lack of pulmonary progress which doesn’t leave him feeling very positive. The fact that there hasn’t been any change since January’s cath is not a good sign in his opinion. The lungs can regenerate and see rapid growth in the first two years of life…regeneration can happen up to age nine but at a much slower rate. He is not, however, without hope. 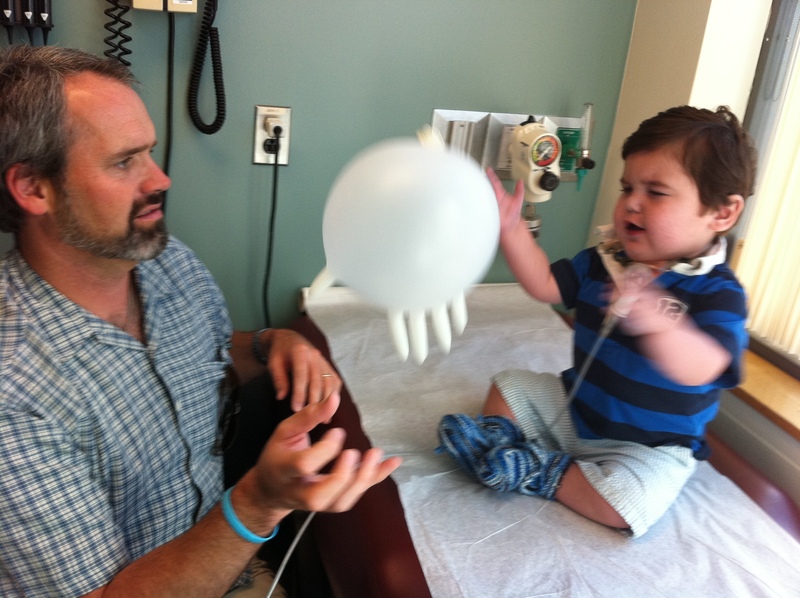 He said he had patients in the past who, at age 3 or 4, all of a sudden saw pulmonary growth so he is not giving up hope for potential improvement for Rudy but there isn’t anything we can do to promote that growth. There isn’t a drug he isn’t already on or a lung treatment that will improve the issues of O2 sats and pulmonary pressures. 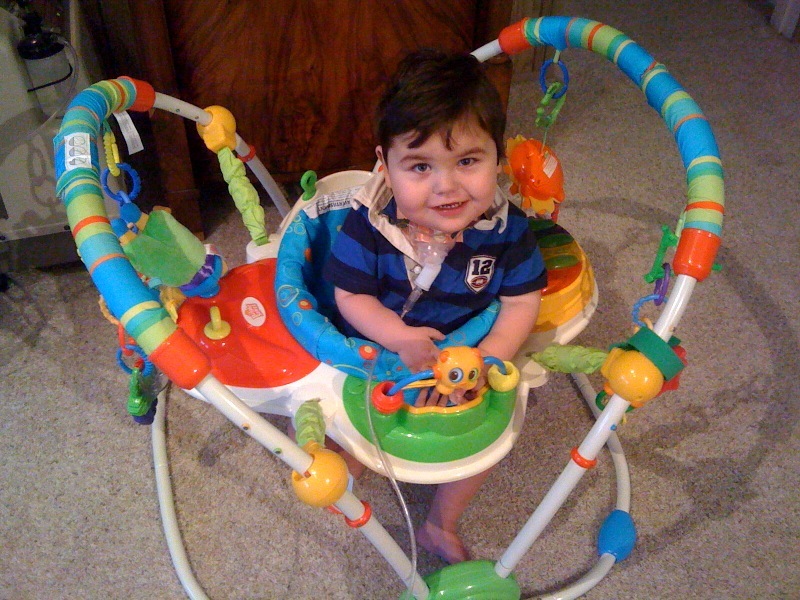 Since the Glenn is not an option at this time, he is recommending decannulation and would like to start the process of setting up a sleep study at either Chilren’s L.A. or Orange County to make sure Rudy can breathe without the trach overnight before we begin weaning him. Rudy’s ENT, Dr. Shapiro, will also need to weigh in and let us know if the scar tissue in his airway needs to be removed before or after the sleep study. Either way, it will need to be removed before we can wean him so his will be a slow process of decannulation. After our appointment with Dr. Pornchai, we met with Dr. Rick over coffee (and a diet coke!). He reviewed the cath results and talked with Dr. Dan so he was up to date on the latest. As always, we appreciated his time and found it comforting to talk through the “big picture” with him. He couldn’t offer us any new alternatives or a “plan B” but he was reassuring. At one point I asked him “What do we do, Dr. Rick?” and his reply was “just what you’ve been doing!”. 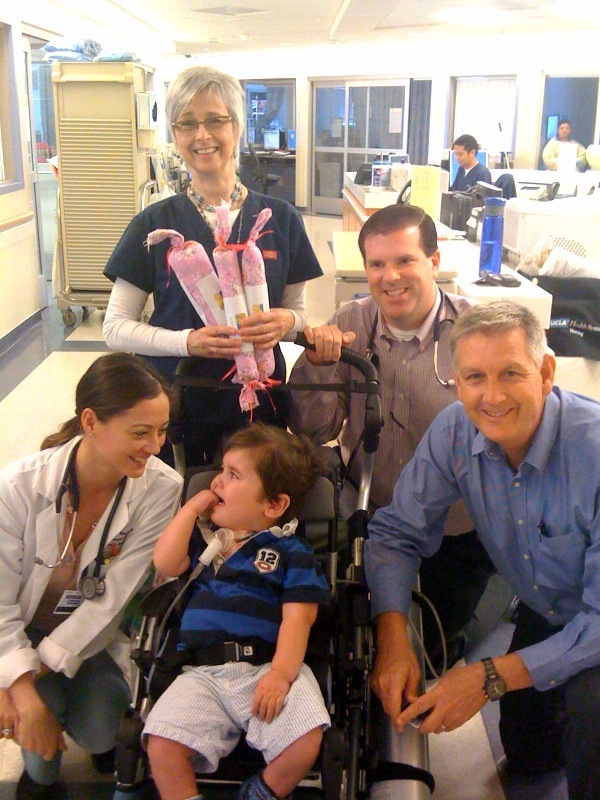 Rudy’s heart surgeon, Dr. Brian, met up with us in the hallway and confirmed that there is nothing surgically he can do for Rudy at this point but that he could put in another shunt if need be. So, we didn’t get news of options for Rudy but we were comforted to touch base with key members of his team. We just kept asking the same questions to everyone hoping someone would give us a different answer…but everyone is in agreement. I met with Rudy’s SB Endocrinologist today and updated him. At one point he said to me sympathetically…”The heart surgery is no longer an option (That’s right) and you understand what this means (Yes, I do) Well, you are doing remarkably well. Rudy is strong and you continue with his palliative care”. When we talk about keeping it all in perspective, I think this is key to remember because nothing has really changed in Rudy’s condition or care. His treatment plan was never “curative care” – his has always been “palliative” (Medical or comfort care that reduces the severity of a disease or slows its progress rather than providing a cure). I guess “palliative” feels alot more secure and less threatening when there’s a plan in place (i.e. The Glenn procedure) but our goal with or without a plan remains the same…just like Dr. Rick said! We do all we can to keep him healthy, comfortable and happy. And whether we are waiting for that “touch of God” pulmonary healing, new medical advancements or letting go, the reality is God is in control of it all and we’re all in His hands. When we left yesterday, Dr. Rick walked us to the elevator, gave me a big hug and told me not to worry about Rudy…just love all the kids. It struck me as we were driving home just how good his advice is. When you are stripped of a plan of action, it’s real easy to get caught up in the disappointment and obsess over the lack of a plan…we need to resist this temptation and live life in the moment…loving our kids and believing wholeheartedly that we will navigate through this no matter what. Rolf and I both feel we need to face the harsh reality but do so with deep hope. Whatever will be WILL BE and we have no less control over what is to come than we did yesterday. My mind is adjusting but my heart is slow to follow…our hearts are breaking. Daddy teaching Rudy "Udder Ball"! To add to the drama this week, Rudy has discovered how to pull off his oxygen mask and freely demonstrated this new skill throughout the day yesterday!! A little frustrating since we’re dealing with a two-year-old who suddenly has an ornery streak!! We certainly don’t need him sabotaging his own treatment at this point. It was a little frightening to wake up this morning and find he pulled the mask off during the night…we’re not sure how long he was without oxygen but he seemed ok today. When we wean him off the trach, he’ll need to get his oxygen through a nasal cannula…yeah, that will go over real well!!! 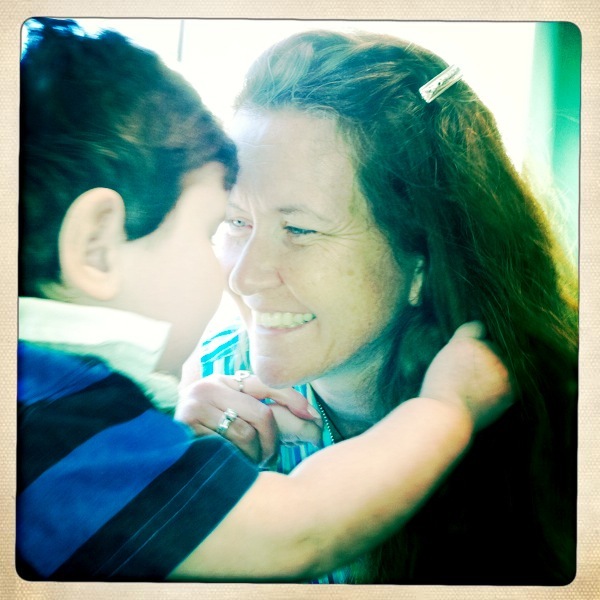 Ok experienced heart moms…HELP! 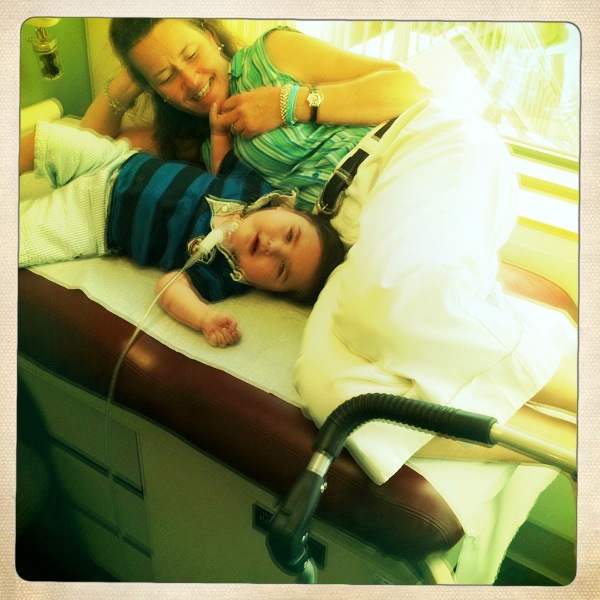 The crazy boy has and always will keep us on our toes…thank you for your continued prayers. Your prayer support is essential to us and we are grateful!!! Has it really been 25 years?! As Trish shared in the last post, we’ve spent this weekend absorbing the news from the cath last week. I’d have to say we’re feeling our way through things so far as we’re not really at the stage of thinking or planning our way from here–we’ll get there–some realities take awhile to sink in. In the year and a half since Rudy’s been at home with us, the Glenn has loomed as a monolithic milestone–a scary but necessary rite of passage; the next step in prolonging Rudy’s life…and now it’s not there. So much of Rudy’s journey has been one of uncharted waters–unique complications and prolonged treatments, but having one of the fundamental interventions taken off the table feels like something of a different magnitude. We’ll likely get to the point of cogent thinking at some point and will update then, but for now it’s the feelings. On that front, it’s been a quiet weekend with enough activity to keep us occupied. The feelings are there–sometimes it’s a heaviness, other times irritability, sadness and confusion. Thanks for kinds words, space, company and normal routines all in good measure. Within all of this, there is gratitude–first and foremost just for who Rudy is–how many minor miracles must there have been to sustain him through this? 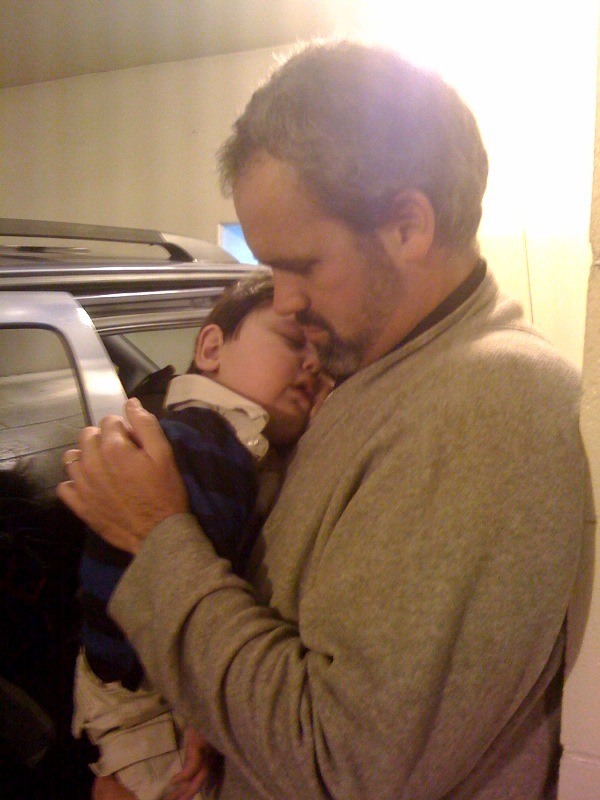 We’re grateful for our big kids and there handling of this; some of the most poignant moments this weekend came during unexpected exchanges where they grappled with the reality of Rudy’s condition. On the subject of gratitude, a helpful distraction for me this weekend was my 25th high school reunion. Unfortunately, it was in New Jersey so I couldn’t make the trip to be with the rest of the class of 1985, but I did send this little video greeting. Based on the feedback I’ve gotten, it probably left a more favorable impression of me than had I actually been there in person ;-). Amidst daunting circumstances, the chance to reflect on the journey that brought me here and for the richness of life and experiences fills me with gratitude. I missed seeing all of you Madison Dodgers! For the rest of you, hope you enjoy it. Today was a low key day getting Rudy settled again and trying to put what we learned yesterday into perspective. 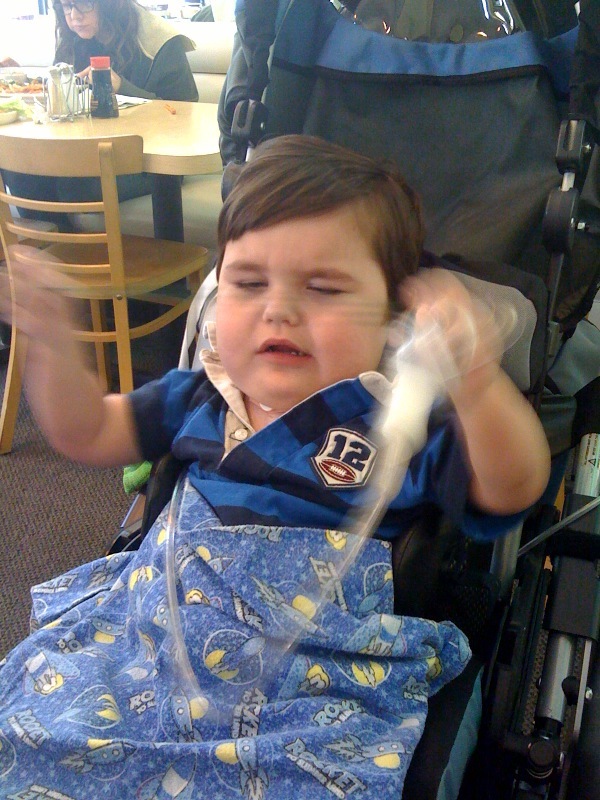 Rudy is bouncing back quickly…he woke up uncomfortable and fussy but perked up after a dose of Tylenol. Rolf and I have been walking around in a bit of a fog not getting a whole lot accomplished but I’m thankful we had today to decompress. So, now we sift through all our questions and try to figure out what it all means. As Rolf reported yesterday, Rudy’s lungs have not shown any improvement and because of the high pressures and his chronic pulmonary disease, he is not a candidate for the Glenn. His lungs would not be able to support the recirculation of the Glenn and he would, most likely, not survive. Needless to say, we are deeply disappointed. As it stands now, the Glenn is off the table. Unfortunately, Rudy would not be considered for a heart transplant either for the same reason. He would need healthier lungs to support the acceptance of a new heart. 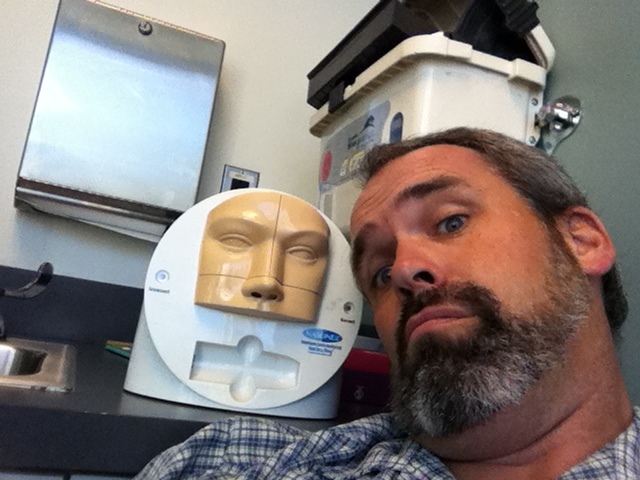 We didn’t inquire about a complete heart and lung transplant…it’s too early in the process to consider that, I think. Both Dr. Harake (SB cardiologist) and Dr. Dan (UCLA cardiologist) agreed that the good news is Rudy is content, happy and growing in his present state. The shunt put in his heart during the Norwood procedure at birth has narrowed a bit (started out at 5mm and is now at 2.6mm) but is in good condition, allowing the necessary blood flow and his right ventricle is strong so he is in a “safe” place while we wait. Dr. Dan also pointed out (and we agree) that eventhough the results are not at all what we hoped for, they are definitive results making it very clear we are not to proceed with the Glenn. If there had been a slight improvement in the oxygen levels or a decrease in resistance, we would have found ourselves in a gray area with the temptation to move ahead potentially putting Rudy at great risk. Now, it’s very clear we wait. What we’re waiting for, however, is not so clear. Drs. Dan and Harake didn’t want to comment too much on what options we may have until they conference with the rest of the cardiology team (which will happen early next week) as well as Dr. Shapiro (ENT) and Dr. Pornchai Tirakitsoontorn (Pulmonologist). It just so happens, we have a scheduled appt with Dr. Pornchai on Tuesday morning at UCLA and a follow up appt with Dr. Harake here in town next Friday so we should have more information by the end of next week. The bulk of our questions are for Dr. Pornchai at this point…we need to find out if there is ANYTHING we can do to help improve the health of Rudy’s lungs. Dr. Harake wants us to continue the two Pulmonary Hypertension drugs Rudy has been on the past 6 months. We hope Dr. Pornchai will know of any other medications or therapies that might address the ventilation and circulation issues in Rudy’s lungs. Dr. Pornchai has always been optimistic that the lungs would regenerate as they often do in the first 2 years of life. Since Rudy is now two, we wonder if there is still hope of regeneration or if we have maxed out on that window of opportunity and his lungs are as good as they are going to get. Drs. Dan and Harake were able to reassure us, though, that we’re not dealing with a ticking time bomb. When Rudy begins to outgrow the Sano Shunt, it will be a gradual thing that Dr. Harake will be able to monitor during our monthly echo appointments. As far as we understand at this point, if Rudy were to outgrow the shunt and his lungs were still not ready for the Glenn, they could put in a bigger shunt. People have survived years with shunt replacements. Of course, this is not the best case scenario for us but it is comforting to know we’re not on the lookout for sudden heart failure! There is still alot of discussion that needs to happen among the doctors involved and we’ll take our time to wade through all the information but, for now, we feel we need to make a big mental shift and proceed as if the Glenn is not an option in the near future. This is significant because there is quite a bit in Rudy’s care that we have shelved until “after the Glenn”. We feel (and Dr. Dan agrees) that our next step is to go to all of Rudy’s specialists and let them know that the Glenn is not an option and inquire as to how they would proceed in caring for Rudy in their area of expertise. Things like….revisit the plan to decannulate with Dr. Shapiro, talk to Dr. Kelts about Rudy’s food aversion and getting him to a food clinic of some kind, maybe changing the approach to his physical therapy, etc. Our primary concern has always been Rudy’s quality of life and that hasn’t changed but “quality of life” now has a broader definition. We don’t believe that Rudy’s condition is as good as it will ever be but we also feel like we are at a point where we need to provide an opportunity for Rudy is develop as much as he is able to in his current condition and not wait for his condition to improve as we have been for fear of putting too much stress on his heart, etc. We’re still not sure what that means for us exactly and we’re still trying to process our feelings about it all but we have hope, a deep trust in the power of God and love for each other so we walk in faith that these things will indeed remain throughout this journey – wherever it takes us. Rolf and I are also very grateful for the care and concern we felt from Dr. Dan and Dr. Harake in all of this. Dr. Harake said at Rudy’s monthly appointment on Monday that he was so proud of Rudy and yesterday he sat with us for a long time as we absorbed this information and reiterated how exceptional Rudy is…very tender in his communication to us. We were touched this morning by a follow-up call from Dr. Dan to not only check on how Rudy was doing physically after his day in the cath lab but also to find out how Rolf and I were doing…so patient to address and affirm our concerns. One thing is for sure, we couldn’t be in better hands and we are grateful Rudy has a team both here in Santa Barbara and in Los Angeles that care deeply for him. We are blessed by them and you! Thank you for all the amazing comments, emails and Facebook messages…for your prayers and for feeling the hurts as well as the joys with us. We are overwhelmed with mixed-emotions but we are ever-grateful. Questions, quandries and worries are in good supply but for now we’re just glad to be here while our champ returns to form. Crazy about this kid!